Orlake was founded in 1963, and is now defunct. They offered full range of vinyl products; picture discs, shaped discs, and colored vinyl, in addition to regular black vinyl. They processed metal plates in-house, but they did not cut the masters. They pressed all of Tupelo's colored vinyl through Mayking's arrangement with MPO , and all of Geffen's colored vinyl and picture disc releases as seen from the matrix codes, at least while Nirvana was active. They also pressed the various Warner reissues of Bleach , except the black vinyl from 2010, again as seen from the matrix codes. The matrix codes were handwritten onto the lacquers or copper masters by the pressing plant, and not by the mastering studio which cut the lacquers. In addition to the regular catalog number and side information, they also wrote their company name in the matrix codes, or sometimes the initials, "OR". The only exceptions were mastering studio or mastering engineer signatures. The mastering studios only wrote the catalog numbers and side information around the outer edge of the masters to keep track of them before plating, when this area is trimmed off . This means that the matrix codes only identify the pressing plant, and the different mastering studios cannot be identified by the matrix code font or pattern, unless they signed the cut. Image 1 shows an Orlake matrix code, which was also signed by the mastering engineer, Stuart Hawkes, while he worked for Copymasters, later known as Masterpiece. Hawkes also cut the black 7" and 12" records, which were pressed by EMI. 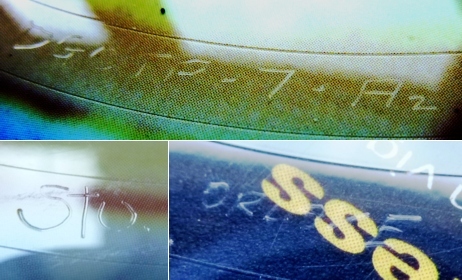 Most of the matrix codes on the records they plated and pressed seem to have been written by the same person at Orlake, as the handwritten style remains identical, particularly the "A" with the flat top. Orlake did not write the matrix codes on the Nirvana records they pressed for Tupelo, or on other records which they did not plate themselves. In the case of the Tupelo releases, Orlake received mother plates from MPO. In one case, when pressing the white Bleach (TUPLP 6) records, they scratched over "MPO" on the mother plates before processing the stampers, but did not inscribe their own name.